mmsonline.com November 2017 MMS 81 FEATURE A utomation is apparent even to the untrained eye when obser ving Phoenix Proto's new five-axis machine with six-station pallet pool and pallet-loading system (the same goes for one of its similarly equipped three-axis machines). That said, there are other, perhaps subtler, elements of automation that comprise the shop's five-axis process. 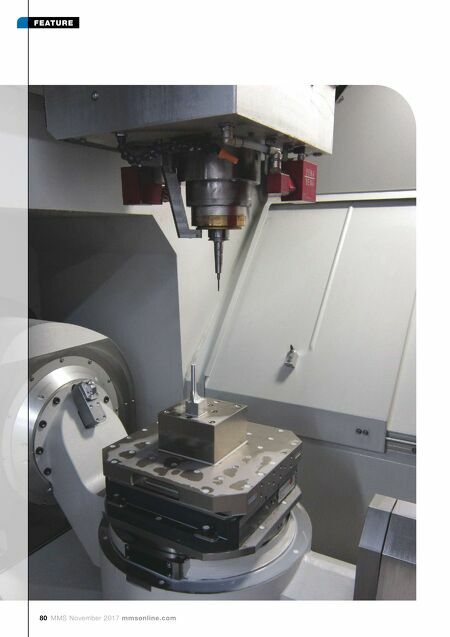 In fact, it's these elements that enable the process to repeatedly achieve the tolerances and surface finishes required for the shop's alu- minum mold components while, with minimal if any human intervention, adjusting for the inherent variables that can adversely af fect machining precision and throughput. This point about throughput is impor tant, because the Centreville, Michigan, shop's goal is to prov ide as se mble d aluminum molds to customers within three weeks, so fast turnaround of q u a l i t y, m ac h i n e d to o l i n g c o m p o n e nts i s imperative. 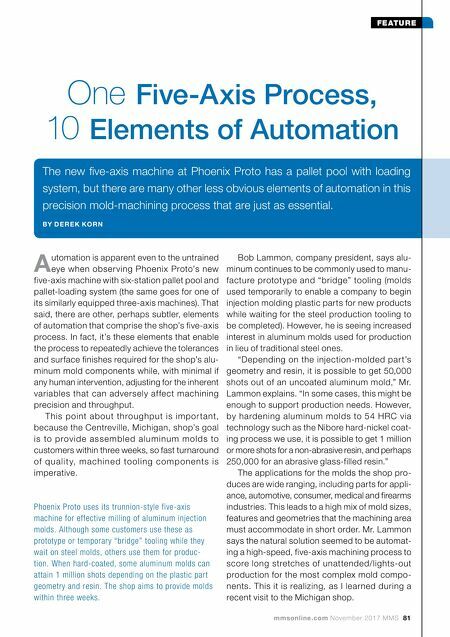 One Five-Axis Process, 10 Elements of Automation The new five-axis machine at Phoenix Proto has a pallet pool with loading system, but there are many other less obvious elements of automation in this precision mold-machining process that are just as essential. BY D E R E K KO R N Bob Lammon, company president, says alu- minum continues to be commonly used to manu- facture prototype and "bridge" tooling (molds used temporarily to enable a company to begin injection molding plastic parts for new products while waiting for the steel production tooling to be completed). However, he is seeing increased interest in aluminum molds used for production in lieu of traditional steel ones. "Depending on the injection-molded par t's geometry and resin, it is possible to get 50,000 shots out of an uncoated aluminum mold," Mr. Lammon explains. "In some cases, this might be enough to support production needs. However, by hardening aluminum molds to 54 HRC via technology such as the Nibore hard-nickel coat- ing process we use, it is possible to get 1 million or more shots for a non-abrasive resin, and perhaps 250,000 for an abrasive glass-filled resin." The applications for the molds the shop pro- duces are wide ranging, including parts for appli- ance, automotive, consumer, medical and firearms industries. This leads to a high mix of mold sizes, features and geometries that the machining area must accommodate in short order. Mr. Lammon says the natural solution seemed to be automat- ing a high-speed, five-axis machining process to score long stretches of unattended/lights-out production for the most complex mold compo- nents. This it is realizing, as I learned during a recent visit to the Michigan shop. Phoenix Proto uses its trunnion-style five-axis machine for effective milling of aluminum injection molds. Although some customers use these as prototype or temporary "bridge" tooling while they wait on steel molds, others use them for produc- tion. When hard-coated, some aluminum molds can attain 1 million shots depending on the plastic part geometry and resin. The shop aims to provide molds within three weeks.